Hi you guys! Today I'm sharing this pineapple print romper I just finished for Jensen and I can't handle the cuteness of it! This fabric was a Hobby Lobby find! I almost always go to Joann's for fabric because I can work those coupons and get great deals (and sometimes I have a gift card thanks to my awesome family members that know me so well!) - so I was pleasantly surprised at the amount of cute fabrics in Hobby Lobby right now! I knew if I didn't snag some of this adorable peachy/pink polka dot pineapple print fabric I'd be kicking myself if it were to be sold out next time I'm in the store! I have enough fabric left to make one more romper - so if you're in the market for a baby or toddler girl romper hit me up and I'll make you one on commission! :) I love the ruffled pocket detail too - so girly!!! Jensen got so excited when I showed it to her. I love this age - she is thrilled with any clothing I make for her!!! Gotta take advantage of this while I can, right?! Recently my husband asked me what I wanted for Mother's Day - since Jensen is still so young he's in charge of the shopping! ha ha! I really don't need anything, but its always fun to get a gift! I think I told him that I wouldn't mind having a new watch! 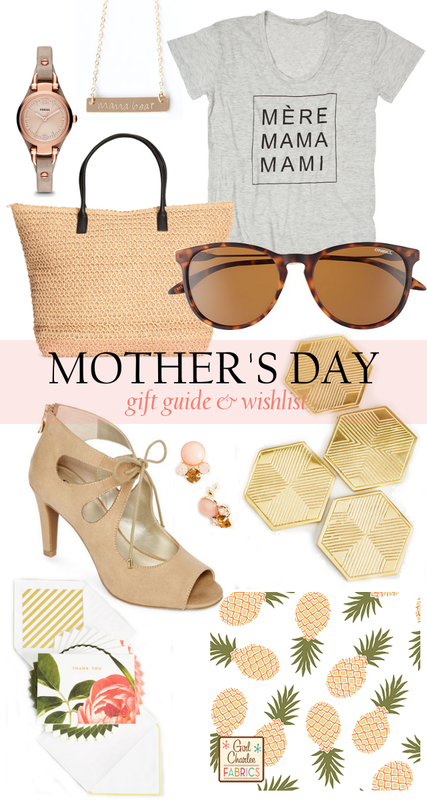 While browsing around online I found several other items that I think most young mamas would enjoy getting for Mother's day! I think this Fossil watch is my favorite! How cute is this 'Mama Bear' necklace from this Etsy shop! What mama wouldn't love sporting this cute tee that says Mama in three languages from ILY Couture. This roomy tote is perfect for spring and lugging around all the mom things (snacks, diapers, wipes, etc!). You can't go wrong with a pair of tortoise sunnies and these are a nice classic shape! These pretty pumps and these earrings because moms like to get dressed up too! How awesome are these gold coasters..you know moms are notorious for telling people to use a coaster! This stationary is super cute! And lastly, if the mom is a crafter/seamstress like me, you can't go wrong with Girl Charlee Fabrics..like this cutesy pinnapple print! NEW LISTINGS IN MY ETSY SHOP! Hello! Just popping in to share a few photos of some new listings that are now live in my Etsy shop! The little dresses are so cute! The aqua Ikat print dress with bloomer shorts is a size 2T and the grey bird print dress with diaper cover is a 12-18 month size! I am about to begin working on a few custom orders here pretty soon- a dress for a baby girl and a cute little outfit for a baby boy! Can't wait to share photos when I'm done! custom bow ties, suspenders, & baby girl dress!